Extra cushioned footbed for maximum protection and comfort. Seamfree toe design and a wider foot construction. 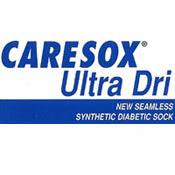 The Ultra Dri Care Sock is non binding, has a low compression in the upper part of the sock which makes it easier to get on and will stay up. Made with 85% Acrylic yarns for exceptional moisture wicking that helps keep feet drier.